These 1 to 1 Development Workshops are created and designed exclusively with you in mind. They are held by James and Bhari at their Studio in Bath and last a full 7 hours each day on mutually agreed dates. The Workshops are a fantastic opportunity for indepth exploration and development of your creative giftings. Attendees are also welcome to return for a ‘Refresher Retreat Day’ on an annual basis if they wish. Bhari also offers mentoring for the following 12 months, if required. This one-to-one Workshop is designed especially for those seeking to develop their business in the creative arts and/or Christian marketplace. This includes prayer, a business review, seeking the Lord for His plans and purposes, with an emphasis on helping you discover the next steps to take. This is a one-to-one Workshop, specifically tailored to meet your individual needs with a view to unblock, breakthrough, release and express the God-given creative gifts you were born with. Plenty of practical ‘hands on’ experience and personal tutoring. Designed especially for those who feel their creative talents have been suppressed or sidelined, those who are experiencing a ‘creative block’ and for anyone seeking a breakthrough in their artistic gifting. If you are interested in getting in touch with, releasing and developing the artist within on your spiritual journey, this is for you. This one-to-one Workshop is specifically designed to meet your individual needs, with a view to discovering how creativity and spirituality are inextricably linked, and how you can blossom and grow artistically and spiritually in your own unique way, hand-in-hand with the Holy Spirit. This is a one-to-one Workshop, specifically tailored to meet your individual needs with a view to release and develop your creative gifts. Plenty of practical ‘hands on’ experience and personal tutoring. Designed for artists, those interested in prophetic art, and those seeking to develop their artistic gifts. If you are interested in getting in touch with, releasing and developing your creative gifts on your spiritual journey, this is for you. This one-to-one Workshop is specifically designed to meet your individual needs, with a view to discovering how creativity and spirituality are inextricably linked, and how you can blossom and grow creatively and spiritually in your own unique way, hand-in-hand with the Holy Spirit. This one-to-one Workshop is specifically tailored to meet your individual needs and help develop your creative ministry further. This includes prayer, a review of your ministry and aspirations, and above all seeking the Lord for His inspiration, and revelation for alignment with your calling and destiny. 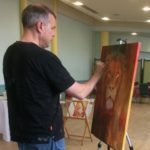 This one-to-one Workshop, is specifically tailored to meet your individual requirements to: paint for / prepare for / organise / promote / oversee or participate in / hold your own group / Church / Ministry / Charity Art Exhibition.This includes practical advice, recommendations and the benefit of over 20 yrs Exhibition experience. This Workshop is also available to groups organising an Exhibition. If you are interested in finding out more about Prophetic Art or developing your Prophetic Art further, this Workshop is for you. This is offered as either a one-to-one or small group Prophetic Art Workshop and can be specifically tailored to meet your individual needs and aspirations. Everything we cover on a Prophetic Art Workshop is offered with the benefit of being able to explore various aspects in greater depth and at your leisure. This is a practical Workshop with plenty of hands on experience and personal tutoring. Everything we cover on a full Prophetic Art Conference is covered over 3 to 7 days and offered on a one to one or small group basis. If you are interested in finding out more about Prophetic Art or developing your Prophetic Art further, this course offers the opportunity to explore Prophetic Art and develop your creativity to a much greater extent. Whether or not you have already attended a Prophetic Art Workshop, you can opt to do as many days of this programme as you wish. This course includes plenty of hands on experience, teaching, training and personal exploration of your prophetic art gifting. Highly recommended for our regular Prophetic Art Workshop attendees.